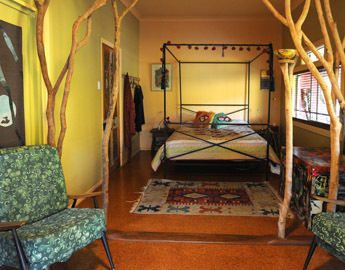 The gabi rose room, everybody’s favorite room, is at the front of the 1920′s weatherboard house. Step inside into a light vibrant space, visually divided by ‘trees’ – woven branches opening to the canopied, netted queen bed-of-peaceful-dreams. The ensuite bathroom makes this room a cosy, royal retreat all year round. Park at the front of the house and walk up the stone step. The gabi rose has its own separate entrance to the left, and a cool verandah sitting area.